Last year I wrote a tutorial explaining how to set up remarketing in Google AdWords, which ended up being one of the most popular posts on my blog. I’ve received many emails from marketers who used the tutorial to successfully launch their own campaigns, which can be a confusing process if you are new to remarketing. That’s awesome, but one common question I received from readers was how to use custom combinations to ensure you present remarketing ads to the right people. For example, if someone converted on your site, you probably wouldn’t want to present a remarketing ad to them asking them to come back to the site to place an order. That can be an embarrassing situation. In order to accomplish this type of targeting, you would need to use a custom combination, which would tell Google to present ads to a specific audience, but NOT for people who already converted. You can think of it as a conditional (Include Audience A, but not Audience B). By the number of requests I was receiving, it was easy to see that people were confused by the topic. Well, the readers of my blog have spoken, and I’ve been listening. I’m happy to announce that the tutorial below explains how to use custom combinations to achieve your remarketing goals (less the embarrassment of presenting ads to people who already converted). Note, “conversion” can mean a lot of things, including an ecommerce transaction, filling out a form, downloading a pdf, or even visiting a specific page on your website. Conversion is determined by your specific business and website and should be determined while building a strong analytics strategy. The tutorial below is for marketers already familiar with setting up basic remarketing campaigns. If you are new to remarketing, I highly recommend you walk through my first remarketing tutorial to gain a solid understanding of the setup. Once you learn how to set up a basic remarketing campaign, you can revisit this post and learn how to use custom combinations for advanced targeting across the display network. I’ll walk through an example below of a common remarketing campaign that would benefit from using custom combinations. For this example, imagine we run an ecommerce site selling sports equipment. We want to use remarketing to present ads to people that visited a section of our site, but didn’t convert. Those ads will show up across the Google Display Network to visitors who viewed pages from that section of our ecommerce site selling sporting goods. For this example, our “audience” will be visitors to our football gear section of the website. This means we’ll need to place remarketing tags on any page within the football section. But again, we don’t want to present remarketing ads to visitors that actually converted (and purchased something). So, we’ll need to make sure we know when certain people converted by creating a second “audience”. We’ll need to add that second remarketing tag to our thank you page, which is presented after a customer completes a transaction. Then we can set up an ad group within our remarketing campaign that uses a custom combination to present ads to only non-converting football visitors. Without further ado, let’s dig in and set up a custom combination, based on the scenario I listed above. Again, I’m not going to cover the initial steps of setting up a remarketing campaign in detail, since that was covered in my first tutorial. Instead, I’m simply going to focus on the process for setting up a custom combination in the AdWords interface. 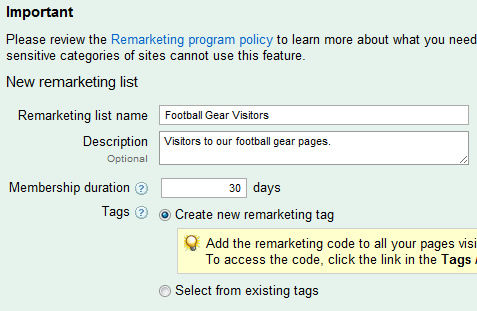 Go to your remarketing campaign (set up during my previous tutorial), and add a new ad group called “Football Gear”. This ad group will contain ads for people that we know visited our football gear pages, but never converted. If you haven’t gone through my previous tutorial, you’ll need to set up a new remarketing campaign and then create this ad group. You can review my previous tutorial to learn how to do this. Remember, this ad group will not contain any keywords, since we will only be presenting ads to the “audience” we are targeting. You can set up a basic text ad when creating the ad group, since we’ll revisit ad strategy for remarketing campaigns later in this tutorial. Set up your first audience (visitors to our football gear pages). 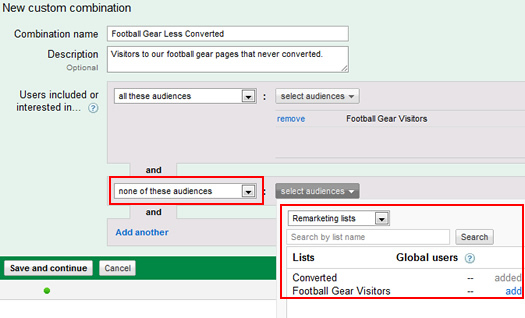 Access the “Football Gear” ad group you just created and then click the “Audiences” tab. Then click the “Add Audiences” button. Note, if you don’t see the audience tab in AdWords, you should review my previous post to learn how to find it. 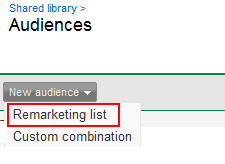 Click “Remarketing Lists”, and then “Create and Manage Lists”, which is located below. 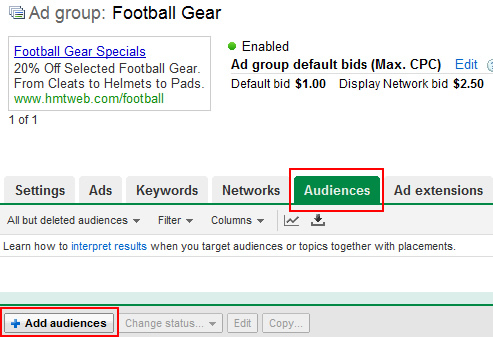 Now click the “New Audience” button and fill out the details for your football gear audience. Note, you should choose “Remarketing List” from the dropdown menu. You can name the new audience “Football Gear Visitors” for this example. You can review my previous tutorial to learn more about this process and the fields you need to fill out at this stage. Once you create your audience, you will need to access the tag that AdWords generates, and include that in all pages within your football category (on your website). 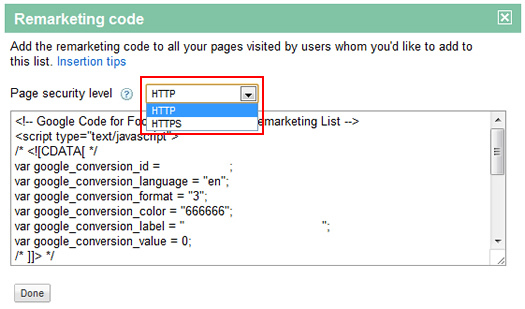 You can find the snippet of code by clicking the link under “Tags/Rules” for the audience you just created. You can place the tag before the closing body tag in your football category pages. Note, this snippet needs to be added to ALL pages in your football category (if you want to target any visitor to those pages). Now use the same process we just went through to set up a second audience for visitors that converted. When you need to get the remarketing tag (the snippet of code), make sure you choose “https” in the dropdown, if the conversion page will be rendered via https. For example, if you are collecting credit card information, then it will probably be https. You can add this snippet to the thank you page before the closing body tag. Note, if you are unclear about using https or http, just check out the URL as you go through the process on your website. If there’s an https in the beginning of the URL, then choose https as your selection. OK, now you have two audiences set up that will become part of your custom combination. Click the “Audiences” tab, and then the “Custom Combinations” link. At the bottom of that window, click “New Custom Combination”. Give your combination a name and description. For our example, let’s use “Football Gear Less Converted”. In order to create a custom combination, you will need to create a conditional using the dropdown menus in AdWords. First, select “all audiences” from the first dropdown titled, “Users included or interested in…” When you use the second dropdown for “Select audiences”, you’ll need to select “Remarketing Lists” to view the two lists you created. The default view will show you “Interest Categories” and not your remarketing lists. Now add your football audience by clicking the “add” link next to the remarketing list. Click the “OK” button below to proceed. Now click “Add Another” to add a second condition. Choose “none of these audiences”, since we want to exclude visitors that converted. Now use the “select audiences” dropdown to select the “converted” audience. Again, you’ll need to choose “Remarketing Lists” once you use the dropdown, since “Interest Categories” will be the default view. Add your “converted” audience by clicking the “add” link. Click the “OK” button to proceed. Click “Save and Continue” to complete the process of creating your new custom combination. Last, click “Save” at the bottom of the window, and you should be good to go. OK, you’re almost there. Your custom combination is set up, which is awesome, but your ad group doesn’t contain a targeted ad yet! At this point, you’ll need to create ads that will be presented to people that visited your football gear pages, but never converted. Note, you can include both text and display advertising in your remarketing campaigns (and I highly recommend doing so). Presenting special offers, discounts, etc. is smart to do, while you should refrain from “We know you like our football section, come back now!” For our purposes, let’s include a 20% off special offer to get those visitors back to your site. We know they were checking out your products already, so maybe the special can nudge them to come back and buy. Also, you can drive these visitors to a specific landing page customized for this audience. You can provide tailored content, knowing they already visited your website (and that they’ll be receiving a 20% discount). Congratulations! You have set up a custom combination in Google AdWords, and you are ready to remarket to a targeted audience! Remarketing in AdWords can be extremely powerful when set up correctly. My hope is that between the two remarketing tutorials I’ve provided here on my blog, you can be up and running relatively quickly. As you can see by going through this tutorial, you can come up with some interesting targeting scenarios using custom combinations. Once you get comfortable with setting up a basic remarketing campaign using custom combinations, you can easily expand to more advanced tactics.